← Who is… The Redeemer? Who is…. The Alpha and the Omega? While studying for the series, Who is…?, I came across another connection between the revelation of Yahweh and Yeshua with which I was familiar, but had not considered in this light. Before we can really explore this phrase, we need to understand that it has MUCH deeper significance than two Greek letters! In fact, it is tied directly to one of the most mystifying words appearing throughout the Tanak!! This is a monumental statement for anyone who is familiar with the Hebrew text of the Tanak! Some 7000 times an untranslatable ‘word,’ את, (Alef-Tav) shows up at critical junctures as a pointer to important characters, concepts or pictures. John had already written his Gospel wherein he begins by identifying Yeshua as the Memra, the ‘Word’ who has been made flesh. John reveals Him as the Good Shepherd, the Bread of Life, the Way, the Truth and the Life… all pictures of concepts that point us to either the Torah, or to Yahweh Himself! 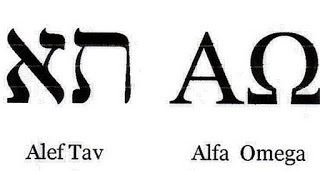 Here, with the alef-tav, את, translated as alpha-omega, John again connects Yeshua with the Torah and Yahweh! We could really take off on a tangent pursuing the wonderful את topic, but that is not the thrust of this post. For a crash course on את I recommend pausing to watch this excellent video by Bill Sanford. He has many others here. As we saw in the opening verses, John in Revelation points to Yeshua as the ‘Alpha-Omega,’ or, more properly, the את. The Alef-Tav. Moreover Yahweh your God will circumcise your heart and the heart of your [a]descendants, to love Yahweh (את־יהוה) your God with all your heart and with all your soul, so that you may live. in that I command you today to love Yahweh (את־יהוה) your God, to walk in His ways and to keep His commandments and His statutes and His judgments, that you may live and multiply, and that Yahweh your God may bless you in the land where you are entering to possess it. The point is, just as we have seen connectivity between Yahweh and Yeshua under the titles of ‘Holy One of Israel,’ and ‘Redeemer,’ we see the same connectivity as the Alef-Tav! Yahweh Yeshua is the First and Last, the Beginning and the End! They are not separate, they are echad! Unified! One! This entry was posted in Who is... and tagged alef-tav, alpha omega, beginning and end, covenant sign, first and last, New Covenant Theology, reformed theology. Bookmark the permalink. 2 Responses to Who is…. The Alpha and the Omega?